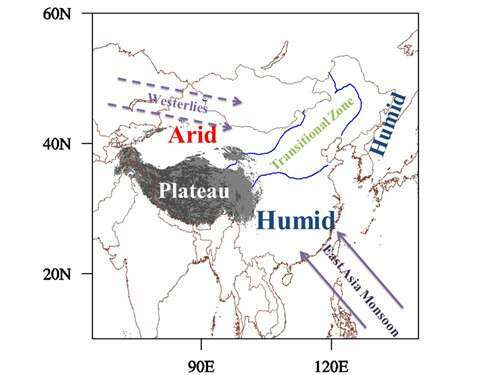 The transitional climate zone (TCZ) between humid and arid regions in East Asia is characterized by sharp climate and biome gradients, interaction between the East Asian summer monsoon and the mid-latitude westerly winds and mixed agriculture-pasture activities. This belt is considered to be "interface fragile" for natural disasters and climatic changes. However, researchers have not extensively studied the variation of the transitional climate zone (TCZ) in East Asia. Thus, there is an urgent need to bridge the knowledge gap on understanding TCZ dynamics. Recently, Dr. Lin WANG, Prof. Wen CHEN and Prof. Gang HUANG from Institute of Atmospheric Physics and Prof. ZENG Gang from Nanjing University of Information Science and Technology have conducted a focused and detailed survey of TCZ. In the historical period, both the front and rear edges of TCZ exhibit wide year-to-year excursions and have experienced coastward migration with increasing aridity throughout TCZ. Furthermore, precipitation fluctuation mainly contributes to interannual variability of TCZ, whereas potential evaporation behavior dominates the long-term trends of TCZ. Models are capable of largely reproducing the shape and orientation of TCZ, although northwestward bias is apparent. "In the global warming scenario period, there will be continuing southeastward displacement for the front edge, but the opposite northwestward movement is projected for the rear one, as a consequence of significant drying trends in the humid zone together with regime shifts towards humid conditions in the arid zone," said Prof. HUANG, "Despite expanded TCZ sector, however, the available water resources inside it suffer little magnitude changes without preferential tendency towards either drier or wetter conditions, implying neither deleterious nor beneficial effects on the TCZ environment."